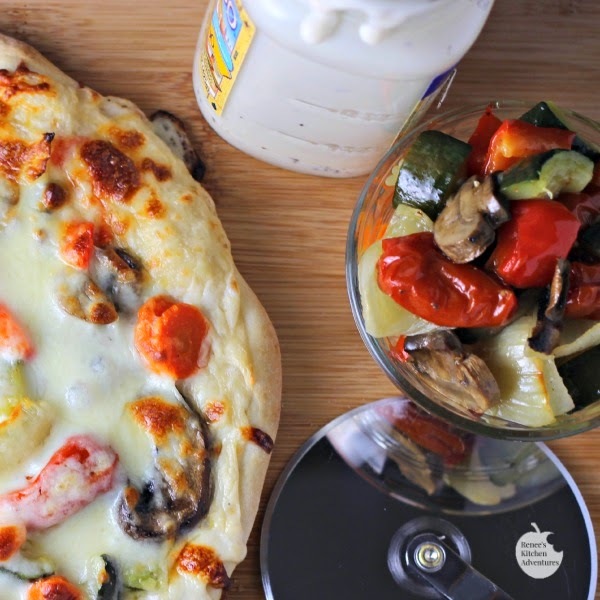 Roasted Vegetable Pizza is an easy dinner idea you can pull together in no time with a little prep work ahead of time. Roasted veggies are nestled on a creamy layer of jarred light Alfredo sauce and covered in mozzarella and Parmesan cheeses for a meatless meal everyone will love! Can I just tell you how much I LOVE oven roasted veggies? I could make a meal out of just the veggies alone. But roasted veggies make great additions to all sorts of recipes too! They are so versatile. Bake up a big batch at the beginning of the week, and you've got side dishes and ingredients ready for all kinds of things... like this amazing pizza or a tasty pasta primavera (recipe coming soon!). Today, I chose to make my own Easy Pizza Dough, but many times when I make homemade pizza, I just purchase the ready made dough I can get at my grocery store. Defrosted frozen bread dough also makes an excellent pizza base in a pinch, as well as Naan bread and flour tortillas. To simplify things, I did roast the veggies a few days before I made this pizza. I actually made extra so we had them as a side dish one night and then I used the leftover roasted veggies for this pizza later in the week. I used a combination of zucchini, red pepper, mushrooms, carrots, onions, and grape tomatoes...but you can use any kind of veggie combo you like...or use whatever you have in your fridge! Make sure you keep the veggies in a single layer with a little space between each piece on the pan to get the best roast. With the help of jarred Alfredo sauce, this comes together really easy. I've sort of always been more of a fan of the "white" pizza than the kind with tomato sauce, so I enjoyed this pizza very much! 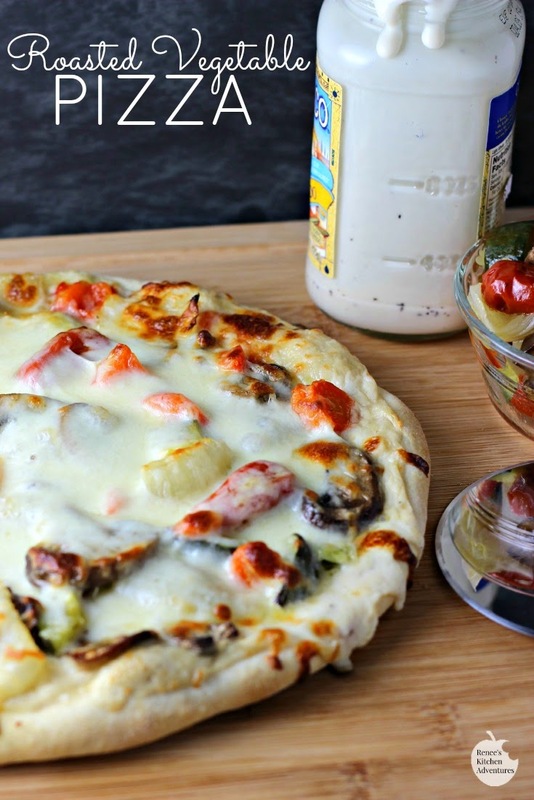 The Alfredo sauce goes so well with the sweetness from the roasted vegetables. 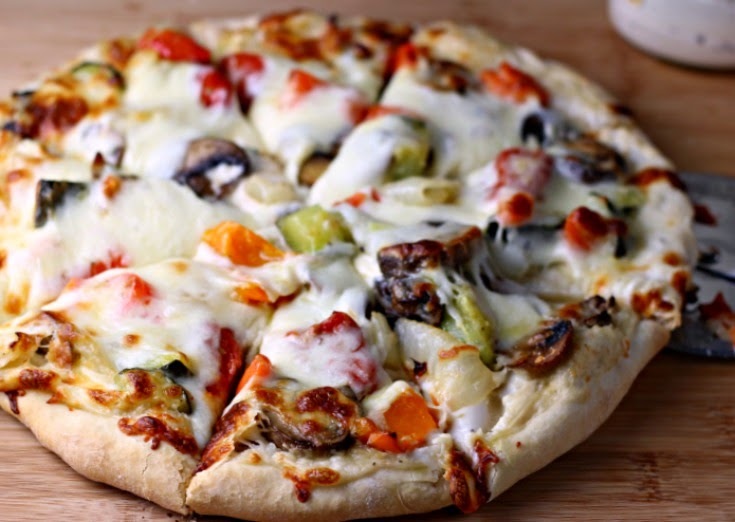 The next time you are planning pizza for dinner, give this Roasted Vegetable Pizza a try! I think you will love it, just like we did! Roasted veggies are nestled on a creamy layer of jarred light alfredo sauce and covered in mozzarella and Parmesan cheeses for a meatless meal everyone will love! Take 1/2 prepared dough and shape it into a 12" pie, on a perforated pizza pan or on a round sheet pan. Spread dough with about a 1/2 cup to 3/4 cup of the jarred alfredo sauce, leaving about a 1/2 inch around the edges uncovered. Place 1/2 roasted veggies evenly around the pizza on top of the sauce. Sprinkle with half the Parmesan cheese and then half the mozzarella. Bake at 450 degrees F for 10-12 minutes or until cheese is melted and starts to turn golden brown. 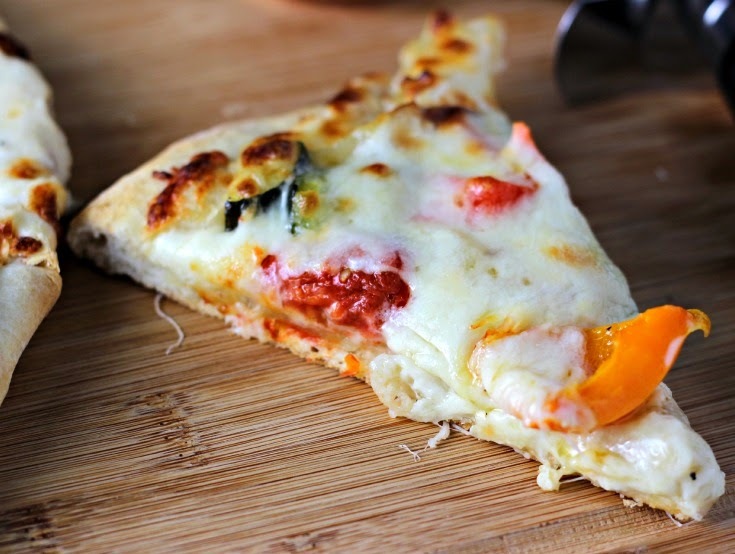 Remove pizza to cutting board and repeat with remaining ingredients to make second pizza. Allow first pizza to cool for 10 minutes before cutting into 8 slices. Repeat with second pizza. Veggie Pizzas are my favorite! and a roasted Pizza sounds fabulous! Your pictures look so great! Roasted veggies are so good! I would love this pizza, especially with the Alfredo sauce! Home made pizza! Looks great, it must be delicious!